The Darlee Elisabeth Cast Aluminum 9 Piece Patio Dining Set is a beautiful, solid, well-built outdoor dining set featuring a large, 64-inch square dining table, eight stacking armchairs, and eight sesame-colored cushions with ties — which will accommodate as many as eight guests, in comfort and style. Constructed from weather-resilient cast aluminum, and topped with an elegant, multi-step, hand finish in Antique Bronze, the Darlee Elisabeth Cast Aluminum 9 Piece Patio Dining Set also features a square-shaped seating arrangement — much like the Darlee St. Cruz 10 Piece Patio Dining Set we’ve seen previously — which enables all who sit at the table to see one another, for easier conversation (no more arching your neck ’round the person next to you). Including fully welded chairs for extra strength, and 100-percent polyester cushions for weather-resistance, the Darlee Elisabeth Cast Aluminum 9 Piece Patio Dining Set also includes a center umbrella hole in the table for hot summer days, and a removable umbrella hole cover for the off-season — and would be best suited to an 11-foot umbrella size, in order to get full coverage of the table. 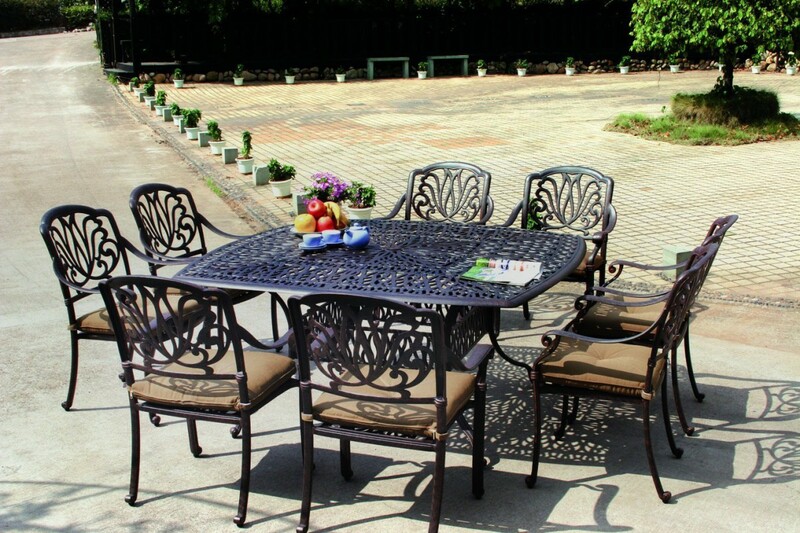 Also benefiting from 1-inch, rubber-like protective feet, with one secured to each leg of the table and chairs, the Darlee Elisabeth Cast Aluminum 9 Piece Patio Dining Set can be safely used on wooden decks, tiled areas, or other flooring surfaces, without worrying about scratches or scrapes. With easy assembly (the table top is in one large piece, and the chairs come stacked, and already assembled), the Darlee Elisabeth Cast Aluminum 9 Piece Patio Dining Set measures 64-inches x 64-inches x 29-inches for the table, 22-inches x 36-inches x 25-inches for the chairs, and is available over at Amazon.com (rated 4.8 out of 5 stars from 10 customer reviews) with FREE shipping. Click to see current price.